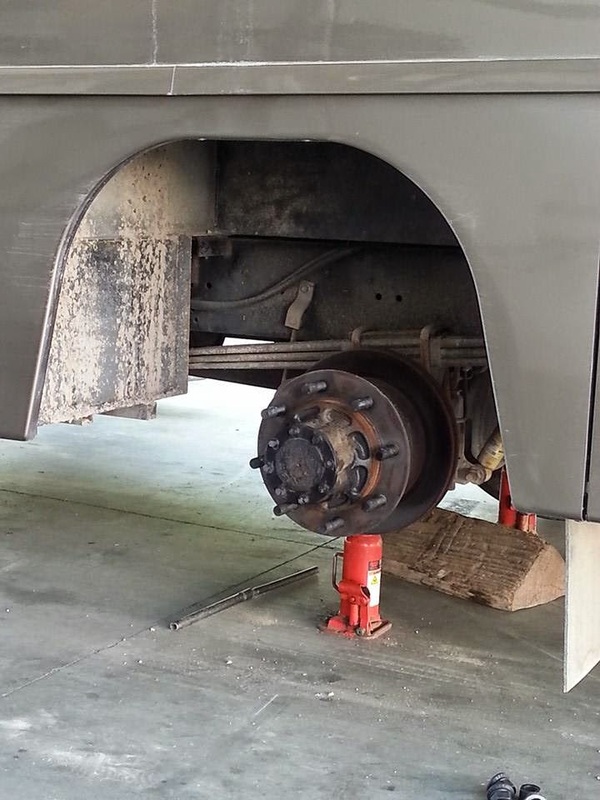 It’s an expense every RV owner dreads but knows is coming…the purchase of a new set of tires. An image of our old tire date code which reads 3507. That means they were manufactured the 35th week of 2007 making them almost 8 years old!! You can also see some of the cracks in the sidewall. Now, despite my (Lynn) 20 year career in automotive service (or maybe because of it) I loath vehicle maintenance. However, since it’s in my wheelhouse pretty much anything that needs to be done to Chuck (the Jeep) or the Mutiny falls on my shoulders. And it’s really better that way, trust me, I know the game. But buying a set of 6 tires for a 20,000 pound RV that also happens to be our home was a whole new ball game, even for me. Okay, if you didn’t click the link I’ll summarize quickly (but shame on you =))…Nina shares a few possible money saving tips (and lots of tire 411 we should all know). One tip is a potentially substantial discount on Michelin tires provided to FMCA members through their Michelin Advantage Program and another is to choose, if you can, to purchase your tires in a state that doesn’t charge sales tax. Tires are very expensive and, depending on which state you’re in, the tax alone could be hundreds of dollars “extra” on your already shockingly large bill. Well, as luck would have it our route was going to have us on the eastern part of Oregon so I joined FMCA and began the process of finding an authorized dealer from their website. And then we hit a snag. The FMCA website was up long enough to charge us our $50 membership fee but I was unable to log on to get my member number and register our credit card, which is required to get any discounts. Perhaps it was my lack of foresight but we were expecting to be Oregon in just a couple of days and wanted to get the tires done now. So, I began making calls. I started with the authorized Michelin dealer in Boise (where we were at the time) and got a quote for non-member prices. I then shopped around in Boise and Eastern Oregon (including a few other Michelin tire dealers). A Truck Repair Shop I Don’t Want to Name (Ontario, Or) Authorized Michelin Dealer: “I s’pose I could do tires on an RV but all’s I got are cheap tires. Class As are nice so you probably want good tires…maybe check with the Costco, they always beat my prices”. While I appreciate his honesty, I not a fan of Costco tires and would not think of putting them on my RV. This is based on my own experience in the automotive industry and is my opinion (which I’m entitled to, thankyouverymuch). Les Schwab (Ontario, Oregon): $3415.08 no balancing-in stock, no sales tax. At this point I was tired of repeating the tire size (which has now become the number I rattle off regardless if you’re asking for it or my phone number) and worried that anyone that did have the tires in stock would some how sell out minutes before we rolled in. I also felt that even if I were able to get an FMCA discount at Jack’s it was unlikely to be less than the Les Schwab quote (even $100 off per tire wouldn’t help much). Obviously, since all of these quotes were for the exact same tires we went with the lowest price, which came from Les Schwab in Meridian. The shop also happened to be just a mile and half from where we currently were parked. Although we didn’t pull into Les Schwab until after 3pm the staff was all over it. We were greeted promptly and were able to double checked the tire date codes to ensure they were “new”, meaning they were produced this year. 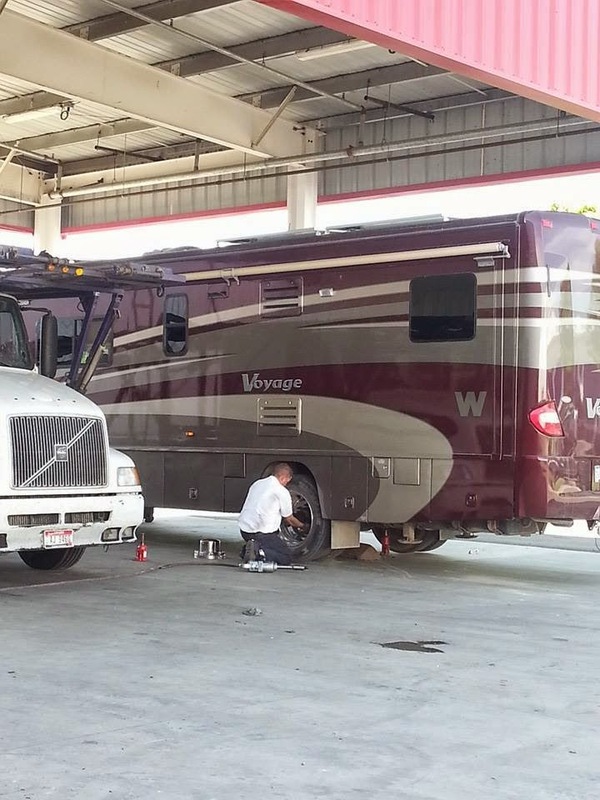 Within 15 minutes they started working on the RV. In the meantime, we got the tires rotated on Chuck…for free (they are also Les Schwab tires). Can you tell we’ve been boondocking on dirt roads? The entire job took about 2 hours…way less than we expected. They basically had a small team working on the RV because they knew we lived in it and it would have to be done the same day. Everyone was great, from Steve O who held our tires, gave me the quote and promised to have us out the same day to the techs and even the lady who does the paperwork. It kinda helped make it a little less painful to hand over the credit card when it came time to pay. 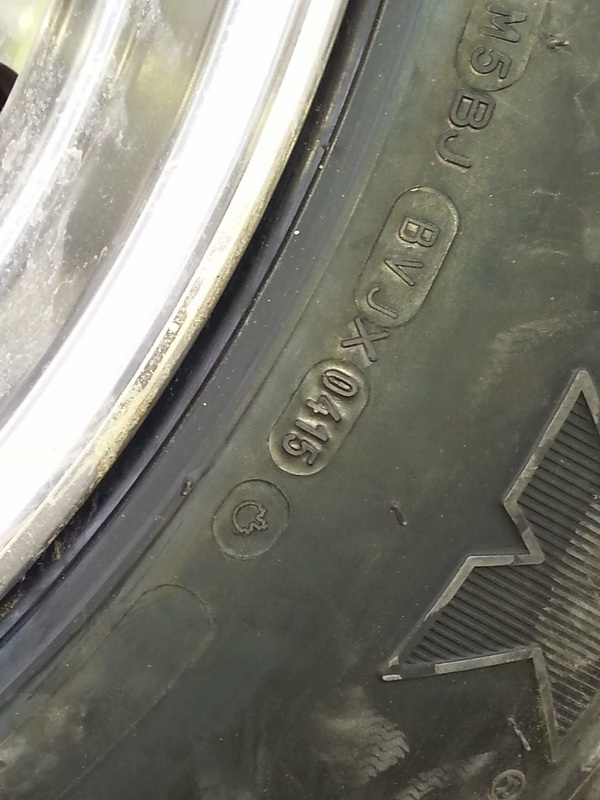 New tire date code 0415…meaning built the 4th week of 2015 *this year*!! 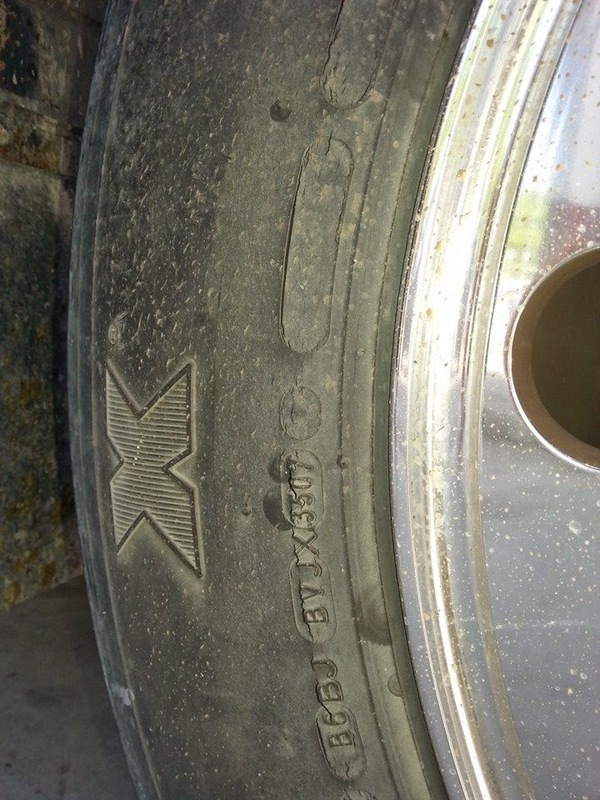 Our old tires were date stamped 3507…meaning they were built the 35th week of 2007. Even though the tread was still good they were old. We also noticed that there were cracks developing in the sidewalls. We really should have replaced them sooner and feel very fortunate they lasted (without incident) as long as they did. Don’t be like us…replace them sooner than later. Since we let a lot of time slip by passing through many towns and cities we realize that we may have been able to save even more money with better planning, perhaps with the FMCA discount. Don’t be like us…plan ahead and don’t be caught in a “we have to do it now, prices be damned” situation. Even though I am not a fan of Costco tires it doesn’t mean I will judge anyone who is…nor does it mean I don’t like Costco. On the contrary, I love Costso. I just don’t love their tires. Feel free to espouse your love of Costco tires to the world on your blog…they just aren’t my thing (and that’s okay). Just because the FMCA Michelin Discount Program didn’t work out for us (this time) doesn’t mean it’s not worth pursuing. Granted, we did spend an additional $50 we normally wouldn’t have but I still have hopes it will pay off before our membership expires. Money is a serious (and mostly personal) matter. We choose to share some of our expenses publicly because we’re weird like that. We also hope it may help someone out there. We try to be real…and honest…but that makes us vulnerable too. We aren’t rich and we planned ahead for this expense. It’s a necessary evil and we hope that by sharing we can help you prepare now so it’s not a big surprise in the future. The FMCA website was down at least two days but is now back up (as of this writing). Poop happens…we get it. We don’t blame FMCA for our crunch time issues. We feel much better now that we have all new tires on both the Jeep (done in November 2014) and the RV (done May 2015)…even with our bank account being lighter. This is especially important as we head to Alaska in a few short weeks. Our journey begins June 1, 2015. Thanks for the precious information.whoever looking for best tyres then visit our Michelin tyres showroom in Kothrud.For any enquiry contact 8055678063.